This article covers troubleshooting the Shoretel TSAPI audio recordings. TSAPI recording, and Xima VRTX are the supported recording solutions. If you are looking to troubleshoot the Shoretel VRTX, refer to this VRTX article here. A solid playback icon represents a recording that is successfully stored in the Chronicall database. If you have issues playing a solid icon please follow this troubleshooting flow to verify your services are running, and you have a sound card on the computer in question you are playing the recording from. Once those steps have been verified for a solid playback icon not playing, refer to our article Chronicall cannot find the recording. If you see a Gray recording icon, please continue to follow the steps below to narrow down the source of the issue. Verify the overall status of Chronicall and the Recording Library. On the Chronicall Home Screen, left click the Bell in the top right corner as shown below. Select the previous business day for your date, and hit Execute. This will display all the calls in Chronicall's Database for yesterday. Cradle to Grave will show you if you are getting all recordings, some recordings, or no recordings. It will also show if you are getting all calls or missing some. If there were calls that were not logged, it will affect recordings associating. If you are missing calls in Cradle to Grave please refer to our Not Logging article linked here. If you see a grayed-out recording icon, that means the call met a recording rule but didn't capture. In the screen below, you can see a call with a blue/white play icon that was captured. Below that is a gray icon, indicating the call met a recording rule but did not capture. Ensure the main Chronicall service and the Recording Library service is running. You can refer to this article here for steps on starting or restarting the Recording Library service. Now we will want to make sure your users are set up to be recorded via the internal recording rules for Shoretel TSAPI. Use this link to Verify your current recording rules, or create a new recording rule for Shoretel TSAPI. Log into Cradle to Grave again, and pull up all calls for the previous business day. Make sure you are enabled to see unassociated recordings in Cradle to Grave and are searching for the previous day. It normally takes around 4 hours for unassociated recordings to show in Cradle to Grave per our default VRTX settings. Refer to this article to display unassociated recordings inside Cradle to Grave to verify you can see these after the 4 hour period. The Chronicall and Recording Library are two separate processes. Chronicall will log the call data while the Recording Library pulls the completed recording from Shoretel. Once Shoretel has finished recording a call it will then use the recording's metadata to associate with a call record in the database. If it cannot find a call to associate with, and "Keep Unassociated" is set to True within the Recording Configuration, then the recording will be listed separately as a "Call Recorded". You will usually see the recording listed right above or below the call with the grayed out play icon. Now you will want to refer to our Shoretel Setup Guide to verify your route point is set up correctly, so Chronicall is able to pull those recordings once completed. If the route point seems to be having issues, you can try recreating it using the linked guide here. Make sure there is no Out Of Ports folder in the Recording Library server, at the file paths below. If there is an out of ports folder here, the issue is that you are running out of recording ports. You will want to upgrade your license to accommodate the increased amount of calls meeting a recording rule. The amount of your recording ports corresponds to how many recordings will be stored at any one time. If you have 8 recording ports, and 10 active calls that meet a recording rule, the last 2 will not show in Cradle to Grave. Are there multiple trunks (phone lines) being captured? If so it is helpful to determine if a specific trunk is having issues. 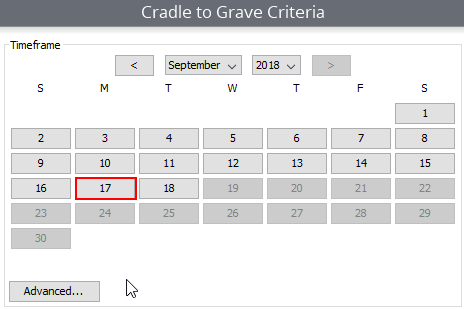 You can right click on the column title bar in Cradle to Grave, and select Trunk from the Drop Down Box. Then drag the Recording Column next to the Trunk Column to diagnose which trunks may be having an issue. 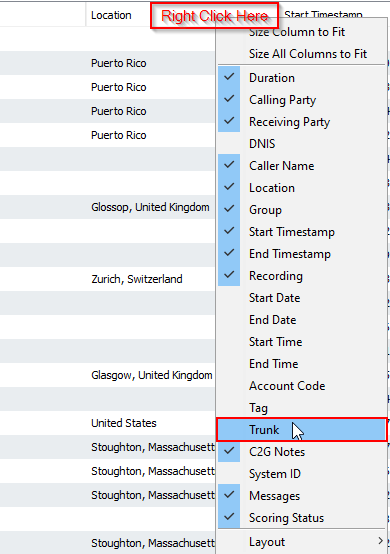 As shown below, once I displayed Trunks below in Cradle to Grave next to the Recording column, I could see that the calls on Trunk 9 are having issues. This helps norrow down the source of the issue.